I love world building, and it was important to me that Moondust's United Earth felt like a real place. I wanted to create a place that felt familiar and strange at the same time. A future that could come to be. I wanted to tackle issues that we might actually face on day - like the energy crisis - but that I also felt the United Earth should have an otherworldly quality, to feel designed, for want of better term. One of the most important things in Moondust’s world is colour. Lunar Inc’s ‘rainbow’ was one of the first things I imagined. Before the story, before Aggie, I saw a colossal lunar base covered in bright, bold, intimidating colour under the deep black void of space. I tested my characters and scenes against that feeling. 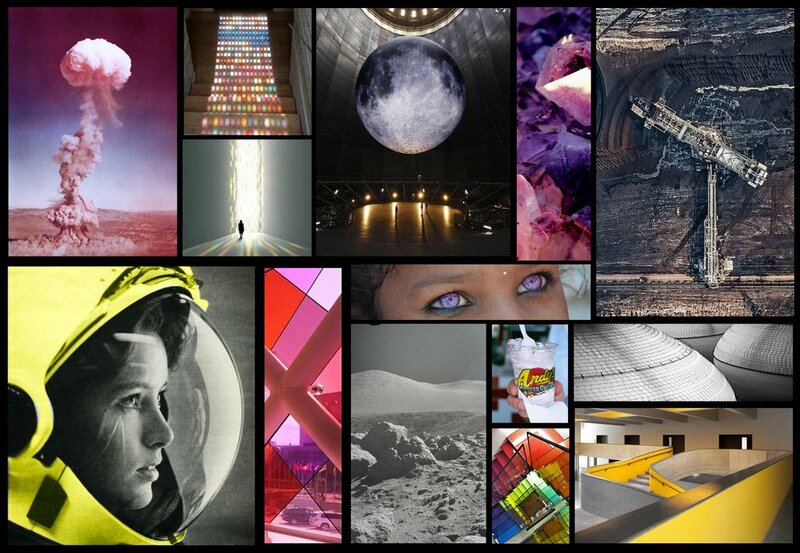 If a person or a setting wasn’t in keeping with Moondust’s oppressive rainbow feel, it (or they) didn’t make the cut. The map of the Lunar Inc. base that I used to plot the movements of characters in the book. Building a world that feels real is all in the details. You have to give it so much more than just the words and scenes that make it into the final edit. You need to colour your world in other ways, give it it’s own history and traditions. I didn’t realise this would lead to drawings and Pinterest boards and maps and logos for things that readers will probably never encounter (well, maybe the logos was going a bit far). For example, I can tell you that Seb’s favourite band is called Sonic Nugget and they sound like kitchen utensils being thrown down a spiral staircase. The frozen custard brand that Aggie and Seb love so much is called Pluto’s, and they serve their deserts upside down, to show how thick the mixture is (something I stole from a real frozen custard place called Ted Drewes in St Louis). I can recite to you a few bars from 'Into the light', the anthem of the United Earth, I can tell you that the students at the Lunar Academy on Earth wear grey uniforms, and that before joining Adam Faulkner's personal bodyguards, a young Rix was kicked out of the Peace Army for insubordination (and not in the way you think). Keeping track of all these little things can make your brain feel like it’s in a centrifuge, but a world only feels real when the details make sense. FIGHT THE LIGHT. A propaganda poster for terrorist group FALL, designed by the brilliant Sam Dunn. Know your Moon rocks! 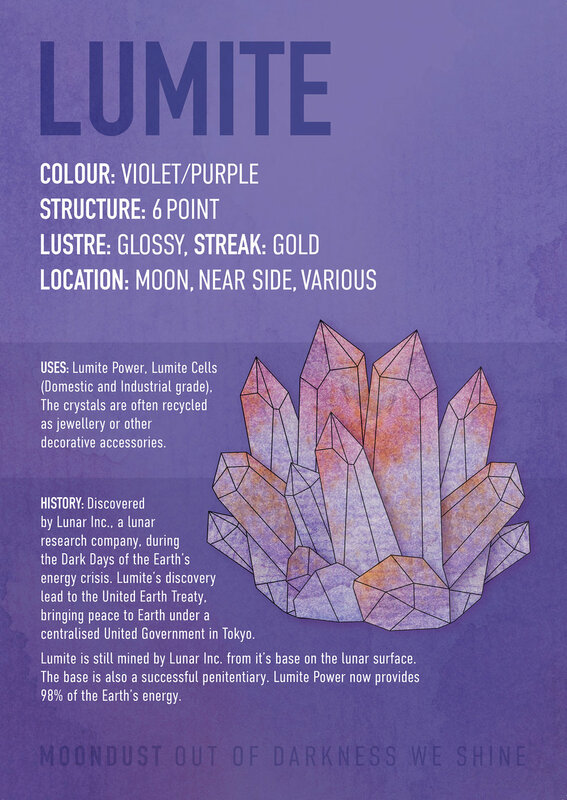 A Lumite infographic poster, designed by the amazing Lorne Bocken. I listened to a lot of music whilst writing Moondust. I find music really helps in those early draft stages and for me, also in scenes that need a bit of action or high drama. It sets the mood of your book or your characters. The soundtrack of Moondust is atmospheric and dramatic, and if I had to choose one track that summed the whole book up, it would be The Funeral by Band of Horses. You can listen to a small Moondust inspired playlist here.